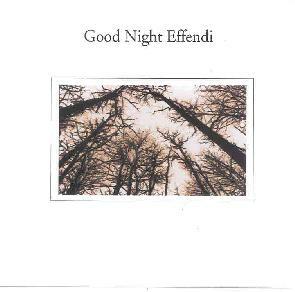 Eric Wallack & Eric Zibbel - "Good Night Effendi"
Recorded in 2002, Good Night Effendi is a collaboration between Eric Wallack and his then 18 year old step-son Eric Zibbel. Including equal parts composition and improvisation, the duo use acoustic and electric guitars, Chapman Stick, percussion, keyboards, loops and effects to create what they call "progressive ambient" music. And indeed that's a fitting label, as the two Eric's create music that is just as meditative and serene as it is cosmic and completely alien. The set opens with "Prelude (After The New Year)", an intriguing blend of lulling acoustic guitar passages, mindbending, wailing electric guitar notes, spacey ambient constructions, and freaky alien electronics. Imagine a New Age Krautrock version of early Genesis (ain't easy is it!). "Wind, Sand & Stars" is similar but the aliens are taking over. I dig the stark contrast between the serene acoustic guitars and the completely spaced out surroundings. It's so different, yet it comes together nicely to create something decidedly off the beaten path. And at 8 minutes Eric and Eric take the time to develop the music into a journey that sounds like Wallack's Galaxies CD (see review this issue), but in far more Kosmiche realms. "Curtain Of Someone" and "Good Night Effendi" both feature cool tripped out psych guitar with a bit of a Frippoid edge and backed by ambient alien electronics (though the latter is far more haunting and gets into spacey jazz territory). Heavy proggy keyboards loom large in the background on "Clockwork", and I'm reminded of a spacey version of Jean Pascal Boffo or Anthony Phillips. More standout keyboards are heard on "Strange Angel", along with swirling dreamlike textures and the acoustic guitars that are such a trademark part of the album. In summary, progressive ambient is indeed what this is... and more... bringing together equal parts enchanting acoustic prog rock, mind expanding space, and healthy doses of freakiness to keep things nicely off-kilter.